Nicole, 33, has been riding since she was 3 years old, and she has brought along and sold “probably close to 40” equines over the years, most of them ponies. Her job in outside sales for a pet food company has her on the road three weeks a month, but, she says, she’s always home on the weekends, squeezing in time for hunter shows, eventing, trail rides and even fox hunting on her latest pony project, a 13.2-hand bay named Applesauce. She’s had Applesauce for about two years and has shown her in the hunters—where Nicole’s passion is. She says she will take the pony eventing next year because although the hunters are Nicole’s love, they are perhaps not where Applesauce’s passion is. The pony is also a “dream to foxhunt,” Nicole says. 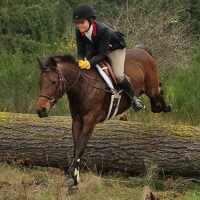 In addition to growing up in Pony Club and having ridden on her college equestrian team, she’s a longtime member of Washington’s Woodbrook Hunt Club—a drag hunt because the state doesn’t allow live hunting with hounds, she said. Woodbrook is said to be the oldest foxhunt west of the Mississippi and takes place primarily on the Army’s land of the Joint Base Lewis-McChord. Nicole’s pony projects all learn to canter down trails with dozens of other horses around, then hang out by the trailer while the hunt has breakfast. full-time career and busy family life. Partly, Nicole laughs, it’s because ponies are cheaper to have and maintain, especially in her self-care boarding situation. And, she said, “I gravitate to their personalities. You can never have enough tricks in your bag. They keep you humble.” And, she added, ponies are closer to the ground when you fall off when breaking the green ones. So with an ability to buy and sell pony projects, why stay an amateur? Her hobby requires the dedication to ride, in Washington’s often rainy weather, in the evenings after work when she’s not on the road, and on weekends in a little uncovered sand arena lit by floodlights on the side of the barn. “For Christmas I bought myself a round pen for breaking green horses,” she said. With Nicole’s busy schedule, her family is a large part of her hobby. Her mother, Linda Harer, is a member of Back Country Horseman of Washington, a group dedicated keeping the state’s trails open for all users and educating horsemen who use the trails in leave-no-trace practices. Nicole says Linda scouts out good trails for Nicole and husband Derek, who also helps out with horse care when Nicole is on the road.